EMC recently made good announcements on OpenStack solution starting from the acquisition of Cloudscaling, EMC Enterprise Hybrid Cloud OpenStack Edition and EMC OpenStack Reference Architecture Partner Program with RedHat, Ubuntu, and Mirantis. Very exciting news that EMC is giving choices of solutions that customers feel comfortable with. Another good news is that EMC Isilon with OneFS 7.2 now supports OpenStack Swift API. Isilon is simple to manage, highly scalable (up to 30PB+ in a single namespace) and highly efficient (80%+ storage utilization) NAS platform. Isilon helps customers to significantly reduce TCO and to resolve their storage management challenge. Key benefits of Swift Object API support with Isilon are first, to allow objects seamlessly accessible as file with SMB, NFS, HTTP, FTP and HDFS. You can build a use case like storing data as object using Swift API and run Hadoop MapReduce analysis job directly on those stored objects via HDFS. Second, all Enterprise features like Dedupe, Snapshots, Storage Tiering are available to Swift Object Storage. Many customers have been using those features for years and also willing to have with new cloud infrastructures as well. 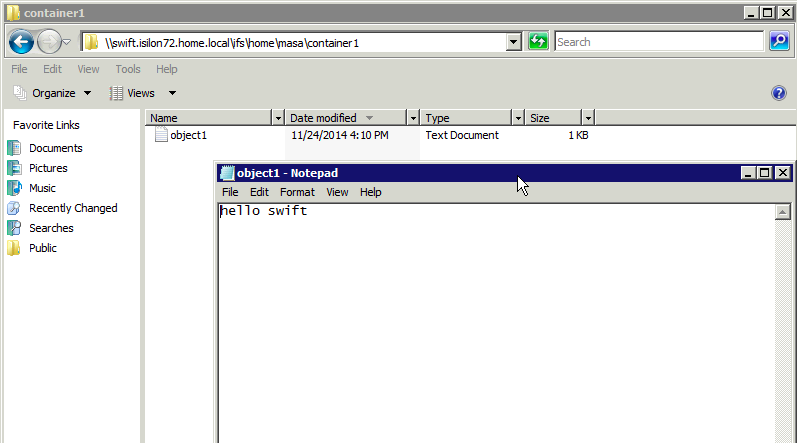 In this post, I will demonstrate how OpenStack Swift API works with Isilon. Each home directory in the OneFS file system maps to a Swift account. The directories and subdirectories in a home directory map to containers and sub-containers. Files appear as objects. When a user is authenticated successfully, OneFS generates a unique authentication token for the user. The token lets the user performs Swift API request without a username and a password each time. Swift API as just “another” protocol. Again, all existing Enterprise features below that customers like are available to Swift Object Storage. The response includes an access token and a storage access token and URL, which the client uses for subsequent requests. Create a new container called “container1” using the acquired token. [root@centos ~]# curl -H "X-Auth-Token:AUTH_tk839346cbf6767f7e940e604ee20f7b24" -v "http://swift.isilon72.home.local:28080/v1/AUTH_masa/container1" -X POST -H "X-Container-Meta-Owner: Masa" -H "X-Container-Meta-Doc-Types: Technical"
Create a object called “object1.txt” with content “hello swift” in “container1”. [root@centos ~]# curl -H "X-Auth-Token:AUTH_tk839346cbf6767f7e940e604ee20f7b24" -v "http://swift.isilon72.home.local:28080/v1/AUTH_masa/container1/object1.txt" -X PUT -d "hello swift"
The Swift CLI is part of the python-swiftclient package and can be installed on any computer running Python 2.6 or 2.7. Let’s try to access object from Windows client via SMB. As described earlier a Swift account maps to each home directory in the OneFS. Containers and subcontainers map to directories and subdirectories in a home directory. Objects appear as files. Also, you can download EMC Isilon OneFS simulator from here http://www.emc.com/getisilon.